Tea isn’t just for parties anymore, you can cook with it, use it in your garden and sleep soundly with it. 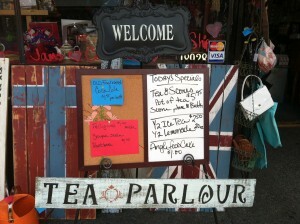 This is why I am so excited to tell you about the Ribbon Cutting and Grand Opening at Sugar and Spice Tea Company! The ribbon cutting will be an open house for the public with delicious samples of several house blend teas and a mix of the new menu dessert offerings. I have to tell you that the baked goods are to die for and I just happened to learn that one of the most popular teas of the shop is the Dr. Blue Who (local whovians clamor for it) AND they were the total inspiration for the real life Tardis bathroom that has become a tourist photo hot spot. At the event you will also be able to meet the awesome Mayor of Poulsbo. They will cut the glorious ribbon at 5pm with photo opportunities available. 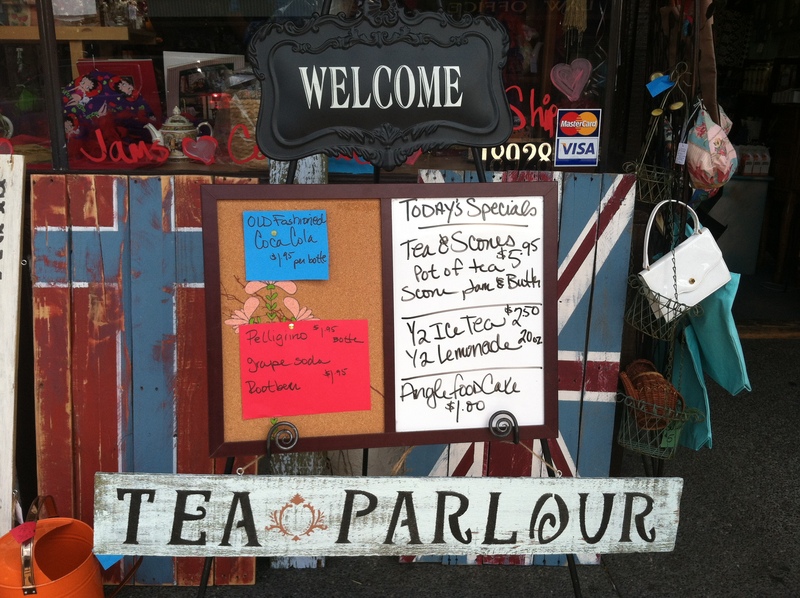 The public is welcome and encouraged to tour the new tea room, sample the new menu items and meet the proprietors, staff and vendors of the tea shop. Sugar and Spice Tea Company was founded with high standards and expectations of achievement. Their primary initiatives are helping the community by educating everyone about the health benefits of tea, showcasing local artists, offering locally grown and prepared foods and hosting fun family (free popcorn) event nights. Sugar and Spice Tea Company proprietors believe that every partner and customer should have an equal opportunity to flourish, be healthy and social. 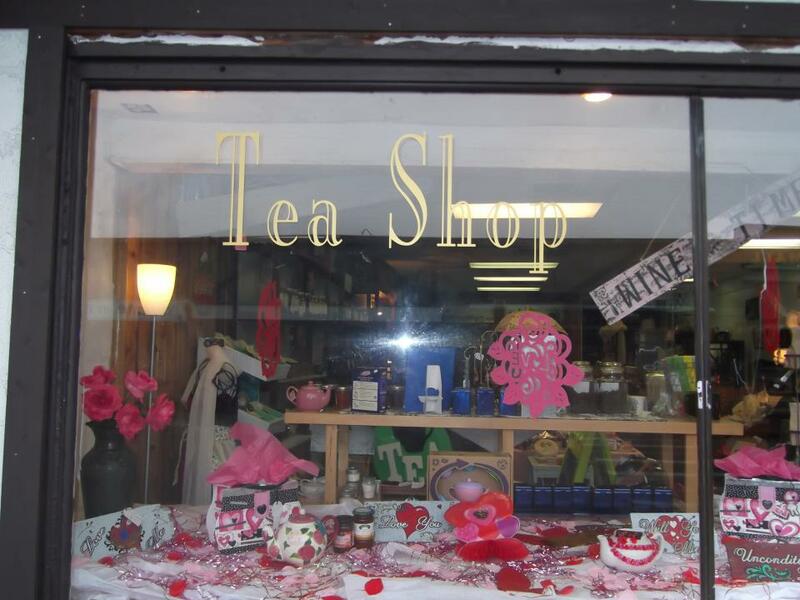 The tea shop has also been very instrumental in providing a new, fresh community atmosphere that helps new residents network and meet new people. I hope that you will mark your calendar for the greatest event of the summer. See you there! What: Ribbon Cutting, Free Desserts, Tea Education, Local Artists, Vintage Items, Free Tea & Community Mayor Networking Fun. Design is everywhere. It can be in the food we eat, the art we buy or the Jewelry we wear. The Designs of the Times Blog is about the people, places and things that help us a enjoy the abundance of creativity all around us. Join us as we showcase the rich designs of our surroundings that make up this great area we call home- Kitsap County! We hope to bring inspiration, joy, and creativity to all who read our Blog. Cash Mobbers get ready to shop local for the holidays! 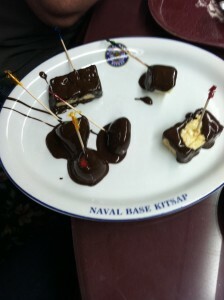 Join (www.kitsapcountycashmobs.com) as they cash mob the Second Saturdays Gift Event by special women! 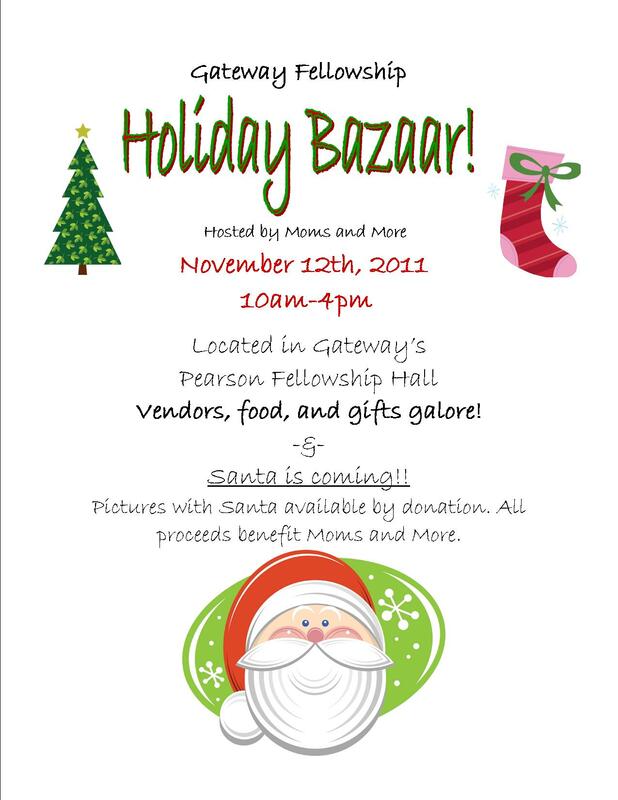 They will be showcasing story bracelets and one of a kind BLING from famous Jewelry designers Libbey, Jill and Gayle. What a treat! 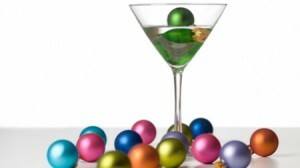 MEN shoppers are welcome and we will help you with gift giving ideas. See below for more guest vendors! Fresh Home made food, coffee and drinks will be available for purchase at The Brownsville Deli next door. Everyone will be IDed for special beverages. Flygirl Feathers that will help you add some sparkle to your hair for the upcoming holidays. Kyle Krafts– Heirloom Baby clothes! PLUS, unique knit gloves and pretty knit scarves. Close To My Heart- Featuring Cindy Kleinfelter with Artisan Made greeting cards, stamps, idea books, and cricut products plus much more! Scentsy all new holiday products! Karen Ebersole Artisan Made Cards with fall designs. 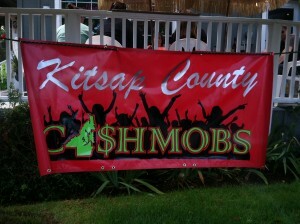 KitsapCountyCashMobs.com cash mobbers are getting ready to spend again! What are you doing this weekend? It is suppose to be a nice weather weekend so join the grassroots cash mob movement and visit a cash mob or two! 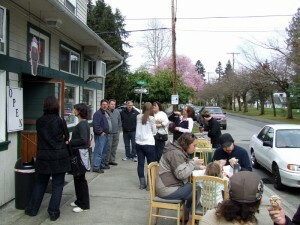 Cash mobbing starts on Saturday April 28, 2012 12:00 PM – 4:00 PM 25960 Central Avenue Kingston, WA 98346 at Nancy’s Green Garden! Get your bedding plants, fresh flowers and artisan gifts! Bring a friend and support a locally owned business. RSVP on the Faceboob page here:…then after that a short car ride away is the Brownsville Deli Cash Mob on the waterfront! Go celebrate the fun at Brownsville Deli (a locally owned and operated Kitsap County Business) This special event will be from 11am-7pm offering scrumptious food (my favorite biscuits and gravy will be served all day long) plus cash mobber deli specials AND wine tasting! 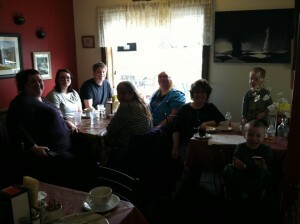 Brownsville Deli Saturday April 28, 2012 11:00 AM – 7:00 PM 9790B Ogle Road NE Bremerton, WA 98311. Celebration food eating will be at the same location! Help a local business, meet new friends and have fun! RSVP on the Brownsville Cash Mob Facebook page here! www.kitsapcountycashmobs.com is administrated by residents, community members and business owners who work very hard everyday to be of service to neighboring businesses and friends. Read More About local Kitsap Cash Mobbing featured in the Kitsap Sun. Our day started early for a breakfast visit at Jak’s Cafe and Espresso where Julie Krucek makes everything in her beautiful cafe from scratch. The family recipes are all gluten free. 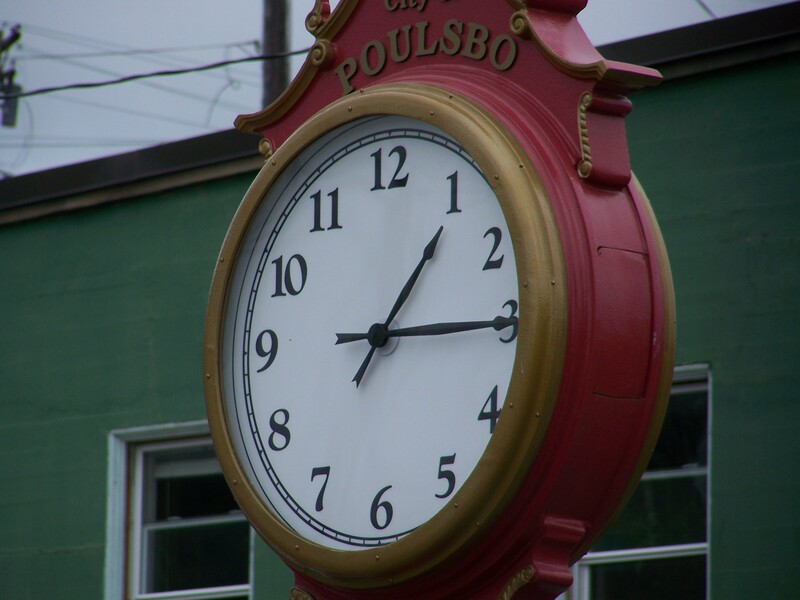 She served up many rounds of egg Benedict and delicious artisan creme puffs and really rolled out the hospitality red carpet by singing Happy Birthday to a local Poulsbo resident. Patrons trickled in all day from 10AM-5Pm and enjoyed their visit to the very well known cafe. 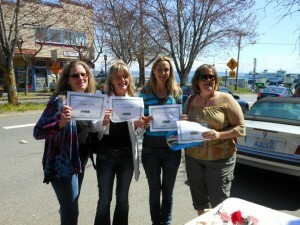 Cash Mobbers from Kitsap County couldn’t have asked for better weather for National Cash Mob Day. “My sales were up 40% that day- Thanks so much! When can we do it again?” stated Julie Krucek founder of Jak’s cafe. The next awesome location was CJ’s Evergreen General Store and Catering where Cynthia Jeffries-Cyr also rolled out the penny candy, Dinner to Go meals from her famous catering department, hot aromatic espresso, ice cream and pies. Bremerton Cash Mobs were instrumental in inviting local residents, creating the certificates of appreciation and showcasing what locally made products were available for purchase. “We bought some of the Sequim Valley Marion Berry Jelly. I’m in heaven!” stated Robin Henderson founder of Bremerton Cash Mobs. 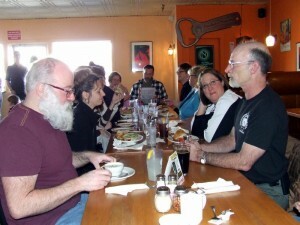 Cash Mobbers and local business owners celebrated the sunny day and the events success at another locally owned establishment by having a nice meal at Rachel’s in Bremerton. Everyone relaxed, socialized and networked with other local business owners and residents that they might not have normally met. It was a very humbling, gratifying and emotional experience for many who attended. Cash Mobbing might be addicting! 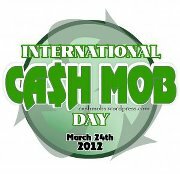 For More Information about how to get involved, visit Kitsap County Cash Mobs Enjoy! I cannot even begin to tell you how good this Thanksgiving meal was and how much it was appreciated. It was pouring rain and our refrigerator had broken the day before so even though we planned on attending the declared special event meal day for DoD, Retired and Military personnel- it was even more advantageous because of our recent household fridge issue. Even from the beginning, getting through the gate was enjoyable, the gate guards were friendly and helpful with directions to the Trident building and had a great sense of humor that was entertaining for a torrential downpour turkey day! When we walked into The Trident Inn the first thing we saw was this gorgeous ice sculpture in the shape of a large fish! That was where the personnel directed us to the self service line (the quicker line) where there was turkey, ham, roast beef (oh my gosh the roast beef!) and all the trimmings. 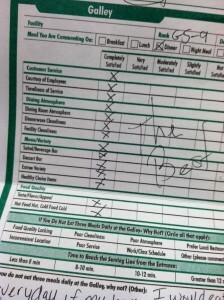 I was most impressed with the sweet potatoes – they were outstanding! It takes real skill to make sweet potatoes with the right amount of spice when you are cooking for masses of people. The desserts were to die for and the running chocolate fountain would have made Willy Wonka jealous! The icing on the cake for me were the HUGE crab legs. I had been anticipating these all week and they were even better than I thought they would be! Even the coffee bar was outstanding with Starbucks coffee and different shots of flavored creamers! The atmosphere was relaxing and people seemed to really enjoy the food and brought family and friends. It was great to see military past, present and current DoD come together for an exquisite meal. 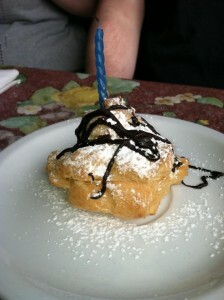 I am just a blogger, PSNS spouse and mom… but I really commend the Trident Inn for a job well done. THANK YOU for the great price and quality of the meal, it made it a great day for all that attended. PS) We would love more Special Event Days so keep us posted if there are more for DoD workers and families! Exquisite Gift Baskets presents raffle winner Rochelle Cramer with a winning gift basket! 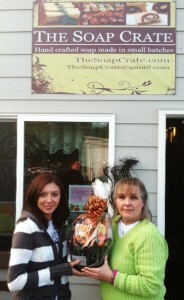 I visited and had a great time at Exquisite Gift Baskets and The Soap Crate in Kingston Washington today. This two dimensional studio style store is owned by artists Donna Schambron (The Soap Crate) and Connie Obee (Exquisite Gift Baskets). The pair recently decided to join forces using Connie’s gift basket design skills and Donna s soap making skills to create a wonderful and unique shopping experience with great gift baskets of food, soaps, and gifts for any occasion that are professionally decorated and adorned with bows, flowers in absolutely gorgeous arrangements for any occasion. I also had the opportunity to view a soap pouring demonstration that was pretty amazing. 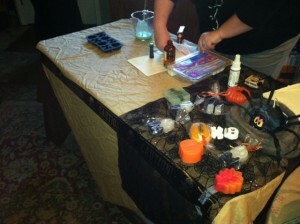 Glycerine soaps were made and decorated and we even got to take home a sample of pretty Halloween soap. I saw soap treats of many kinds- to include shampoo bars for hair, pet soap, and man soap that smells like expensive beer, plus olive oil infused, sweet, luxurious soap that we all love! 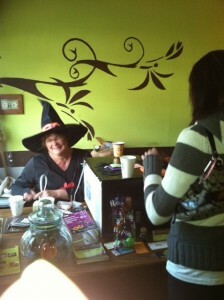 Not to mention I had some scrumptious grand opening food that was Halloween themed! Oh and I almost forgot…They frequently have raffle drawings on special occasions and today we witnessed a very special Poulsbo resident Rochelle Cramer win a tasty gift basket of chocolates, coffee plus cheese and cracker delights! 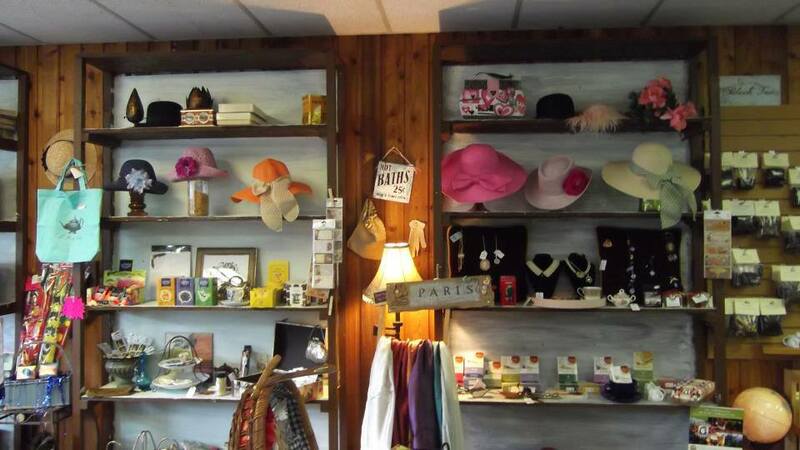 If you like handpicking gifts this is a great place to visit at 26252 Lindvog Road Suite #110, Kingston, WA 98346. Both shops also have websites where online ordering is also available, they service both corporate and consumer clients and are known throughout Kitsap County as the place to go for gorgeous gifts AND delivery is available. Both businesses are very active on facebook ( which I love), so interact and enjoy the pictures they post and see what they are up to! 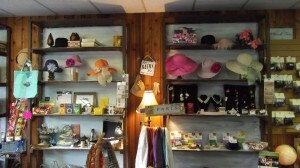 Both shops work together AND independently to meet customers gift needs. So check both of them if you want something designed in a unique theme for any occasion. I visit Exquisite Gift Baskets Facebook Page and The SoapCrate Facebook Page daily to see the latest in gifts and designs. Enjoy! I am happy to report I have recently re-connected with my Uncle Reggie Gebo. We were talking on facebook and he told me he usually catches about 60 to 70 salmon a year in the Great Lakes of Michigan!? It is not often I get to showcase a family member and it made me realize that we often forget and take for granted our salmon abundance. My Uncle Reggie has traveled to many cool places and is an outstanding cook. He has recently started a blog for all of his travels and of his very unique recipes. His new blog is a work in progress so keep checking back often. He adds new content daily! 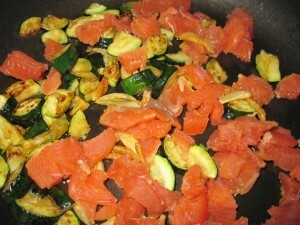 One dish that really caught my sockeye (excuse the pun) was this Salmon and Zucchini Olive Oil Dish and the Linguine with Salmon and Zucchini dinner. And then of course dessert! 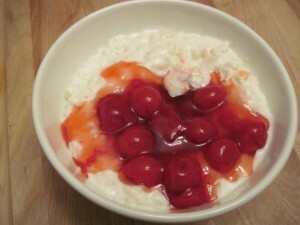 This is his Danish Rice Pudding with Brandy Glazed Cherry Sauce. If you need a fresh cooking and travel perspective for Spring- I encourage you to check out all of Reggie Gebo’s recipes, tips and travel pictures on his new blog. Enjoy!